Washington, D.C., April 21, 2011 - The United States Government’s system for the release of classified material into the public domain continues to be riddled with error, ignorance, arbitrary actions, and simple inaction, while often impaired by parochial agency interests that have nothing to do with the protection of national security secrets, an analysis of a recently declassified document plus associated materials shows. The Obama administration’s efforts to cope with a backlog of more than 400 million pages of documents that have long been queued up for declassification review (see the Archive’s new 2011 FOIA Audit) will remain hamstrung as long as the underlying system rewards inaction amid mounting—and significant—costs both to the American taxpayer and to genuine national security interests. The National Security Archive here posts a case study of sorts—a selection of documents which are analyzed not so much for their historical value as for what the materials show about operation of the declassification system. 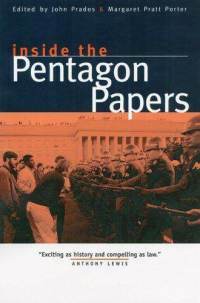 This inquiry has its origins in a quest by Archive senior fellow Jeffrey T. Richelson to obtain the declassification of presidential national security directives issued since President Harry S. Truman (The Archive has published two sets of them in collaboration with ProQuest). During the Kennedy and Johnson administrations, the highest level directives that flowed from the White House were called National Security Action Memoranda (NSAMs). President John F. Kennedy issued 173 NSAMs during his time in office. Reaching the point where only NSAM-29, on Laos, dated March 9, 1961, remained secret, Richelson finally obtained the declassification of this directive on October 29, 2010, almost fifty years after it was issued. As the “last NSAM standing,” NSAM 29 received significant attention inside the National Security Archive. But to the present author, the Archive’s project director on Vietnam war records, it immediately seemed familiar. A search for related records produced the other items posted here, which provide the context for discussion of NSAM-29’s release. More importantly, however, the search disclosed that the document, far from being the last NSAM standing, was already in the public domain, in multiple versions, some more than a decade old. Given present controversies over secrecy in America, the case of the last NSAM illuminates the enormous problems that are endemic in the declassification system. Kennedy administration policy on Laos was the special focus of NSAM-29. The Laos crisis had flared up during President Dwight D. Eisenhower’s final months in office, and during the transition to Kennedy’s presidency it was Laos which Eisenhower told Kennedy would be his biggest problem upon entering the White House. Various U.S. agencies framed action plans to use force in Laos, and NSAM-29 reflects President Kennedy’s agreement with some of those plans. But Kennedy ultimately decided that a negotiated solution would be preferable and initiated feelers that led to the Geneva Agreements of 1962. Though the underlying historical issues are important in their own right, the item notes below and documents posted here frame the specifics adequately. These will be dealt with only as they bear on United States decisions about declassifying the documents. The Laos NSAM, on the other hand, remained classified into the 1990s. When the State Department came to release its official record for this period, the Foreign Relations of the United States, (Note 2) NSAM-29 was not included or even mentioned though other documents in the series presented here were. What made the Laos national security action memorandum so sensitive? The president’s decision ordered the Central Intelligence Agency (CIA) to spearhead important initiatives designed to strengthen pro-U.S. Laotian forces, including both combat and supply functions. Through its proprietary company Air America (known in these documents as Civil Air Transport, or “CAT”) the CIA would move supplies both into and within Laos by aircraft and helicopter. The agency would form a covert unit of B-26 bombers to be based in Thailand for strikes in Laos against North Vietnamese forces and indigenous guerillas and furnish crews for both transport and combat aircraft. It would recruit crews from both U.S. military personnel in civilian guise and third-country citizens (Nationalist Chinese). A CIA-backed Thai special forces unit called the Police Aerial Recovery Unit (PARU) would increase its commitment to another CIA force, the Hmong (“Meo”) secret army, and the Thais would also be asked to send some artillery batteries covertly to Laos. Ten of the directive’s seventeen action points involved the CIA. The secret use of Thai bases and troops for operations in Laos was also deemed important to keep classified for reasons of national security. During the companion war in Vietnam, Thailand became a major base for American forces, particularly air forces, and the Thais openly sent troops to South Vietnam. The Thais later also greatly expanded their covert involvement in Laos. But both wars ended in 1975. In addition, both CIA and Thai participation in Laos had become mere fictive secrets long before the wars ended, since American and foreign journalists, relief workers, scholars, and political activists had all reported on the facts. Of course the facts were also perfectly known to Laotian and Vietnamese communists, so U.S. official secrecy had no impact there. The government of Thailand changed in 1976, and even though several subsequent prime ministers or military strongmen had participated in the Vietnam-war era alliance with the U.S., Thailand’s subsequent forging of closer relations with the People’s Republic of China led it away from the American orbit. After 1975 the government of Laos changed as well, so its interests were not being protected. In short, the need for U.S. official secrecy diminished steadily after 1975. After a certain point the only national security interest being protected by the U.S. government was the open secret of the CIA’s role in Laos. This brings us back to the documents. As seen, in 1994 the Kennedy NSAM was still considered too “hot” to include in the Foreign Relations series. From a declassification standpoint this situation was already unsustainable. Under a 1992 Freedom of Information Act (FOIA) request for Joint Chiefs of Staff chronologies of the war in Laos, the Department of Defense released much of the substance of NSAM-29 (Document 1, p. 42-43) without explicitly identifying the paper. In this version, security officials continued to guard the language concerning the CIA. The presidential directive was first specifically revealed in April 1998 when the copy bearing John Kennedy’s signature was declassified. Again the CIA and Thai involvement mandated by the NSAM was the focus of the deletions made in this release. This secrecy protection extended to related materials. A March 7, 1961 meeting of a Kennedy administration interagency task force on Laos, whose discussions prefigured the decision made in NSAM-29, naturally generated its own meeting record (Document 2a). As early as 1994 this document was included in the Foreign Relations of the United States volume concerning Laos, with deletion of the text that concerned the CIA/Thai Police Aerial Recovery Unit serving with the Hmong secret army. (Note 3) The document came up for consideration again under a mandatory declassification review request filed with the John F. Kennedy Library. In October 1999 the government opened a new version of the task force meeting record. No material was released other than what had appeared in the Foreign Relations series. As of 2000 it thus appeared that U.S. authorities had held the line on protecting the national security “secret” of CIA/Thai involvement in Laos—for nearly 40 years. This was not, in fact, true. Independent researcher Mark Perry had used the FOIA in the late 1970s and early 1980s to examine American policy in Laos. Among the documents released to him was the record of the March 7, 1961 Laos task force meeting, complete with its language that dealt with the CIA/Thai special forces unit (Document 2b). Even at the official level, therefore, government secrecy authorities had breached their own precedent of protecting the CIA’s Laos secret, many years earlier. Officials then proceeded to behave as if the disclosure had never happened, repeatedly refusing to include the same information that had previously been opened. In the meantime it happens that the Air Force had prepared official histories of the war in Laos, culminating in a detailed volume published in 1993. (Note 4) The Archive had filed for this to be released, and the Air Force did nothing despite repeated reminders. In 2005 the Archive filed suit in federal court for declassification of Air Force material, obtaining a partial summary judgment in April 2006. The Air Force history contained substantial material on both the CIA and Thai roles in Laos, virtually all of which was deleted when the history was released in August 2006. This flew in the face of the U.S. government’s own revelation of the CIA’s Laos secret four years earlier. The Archive appealed the Air Force decision, compelling that department to coordinate with CIA and State Department for the release of more CIA information from the history. In 2008 much of the CIA material was restored in a fresh redaction which we then posted. In addition, under a 1992 FOIA request, in March 2009 the CIA declassified its own official history of the war in Laos, (Note 5) which the Archive also posted. Thus by December 2009, when Dr. Richelson filed a fresh request for a copy of NSAM-29, these other events had intervened. The document was finally released to him in October 2010 (Document 5b). The marginal notes on the paper, even though heavily faded by reproduction, show that this copy of NSAM-29 was made from exactly the same original as the version of the presidential directive opened to the public in November 2002 (Document 5a). In addition, another copy of the same document was declassified in the Bromley Smith papers on August 25, 2010 without the researcher being alerted to this fact. (Note 6) In all these documents the redactions are identical to those on the copy declassified in November 2002. Yet even today, on the Kennedy Library website, NSAM-29 is still listed as being classified despite being available in Kennedy’s presidential papers for more than eight years and in the face of its recent release to Dr. Richelson. Deconstruction of the declassification actions on these documents reveals what is in many ways a dismaying story of rampant secrecy, obfuscation and poor interagency coordination. After information had already been declassified in the Laos task force record, officials continued to try to keep it under wraps—and it remains secret in the version to which many researchers have access even today. A presidential directive that was released in at least two forms in several separate documents and in multiple copies was then completely denied—and is still listed as classified in Kennedy Library reference materials. The Air Force was completely unresponsive to Freedom of Information requests, and only when forced to act by a court and a FOIA appeal did it agree to coordinate the release of CIA information that was already in the public record. The CIA took seventeen years after a FOIA request for release of its Laos histories, and in fact created this particular work in part in order to avoid responding to FOIA on the underlying historical studies (see EBB No. 284). When citizens wonder why there is a backlog of over 400 million documents awaiting declassification, actions like these show that the system is still in certain respects significantly flawed. There are a number of reasons why the system is troubled. First, authorities frequently confuse source with substance. A national security secret consists of information, not documents per se. Confronted with a request to open a particular document, officials too often approach the task de novo, ignoring previous decisions on the same information as contained in other source materials, or indeed the same document. This results in a vicious circle in which the same information has to be reviewed again and again, absorbing effort that should be devoted to opening fresh documents. This weakness is compounded because there is inadequate knowledge across agencies—and even within the same agency—as to what has already been released. Second, government agencies follow a concept of “equity,” which embodies a notion that information belongs to the agency that first put it into a document. Thus, its views should be decisive in deciding whether the information can be safely declassified or not. Then that agency claims the primary responsibility for any declassification action concerning that information. In the case of NSAM-29, the CIA asserted an equity in a National Security Council directive because the paper contained instructions to that agency. While it is understandable that CIA wants to protect what it considered sensitive information relating to secret operations, here the CIA was asserting ownership of information in NSC and Joint Chiefs of Staff documents, information that consisted of higher-level instructions which it had not originated, merely because the CIA was to be the designated action agency. Equity is inconsistent with an efficient declassification system. Parceling out (or “referring”) documents to agencies that assert equities subject the records to laborious, time-consuming transit and coordination procedures, complicating any efforts to expedite declassification. Technological innovation makes the concept of equity even more pernicious. When the time comes to declassify computer-age databases, to which many agencies simultaneously contribute, enforcement of equity could induce serious paralysis within the declassification system. Third, the notion that information can or should be reclassified after it is released is a significant problem. Not only can this re-ignite the vicious cycle of multiple reviews of the same document, it can have a deterrent effect. No bureaucrat wants to be responsible for releasing information that may later be deemed necessary to reclassify. This leads to an ultra-cautious approach in which only the most innocuous information makes it past the censors. Under the parallel method called Mandatory Declassification Review, an interagency body can overrule agency decisions, but this falls short of true accountability because the censors suffer no consequences for their initial refusal to open information. In general the system provides few incentives for declassification activism, and the addition of this dollop of bureaucratic caution is potentially crippling. Such attitudes are very likely involved in what happened to NSAM-29. Fourth, classification inflation is a huge problem. Over the years secrecy has been imposed on less and less sensitive levels of information, to the degree that the last (Bush) administration determined to regard “unclassified” information as secret. If “Wikileaks” demonstrates anything, it is that “secret” has been stamped on much innocuous information to avoid putting it on an easily available database. Our presidential directive NSAM-29 was rated “top secret” because it concerned a secret war in Laos. Today that information would very likely be placed above top secret, at the level of “special compartmented information.” Classification inflation plus bureaucratic conservatism adds up to ossification of openness—and a burgeoning mountain of paper in high-tech vaults that that must be carefully watched—which costs money every day. Secrecy has real costs, in real dollars. A system based upon these pillars created the morass in which NSAM-29 was caught, one in which repetitive and contradictory classification decisions kept officials running around in circles. Little progress can be made under such circumstances. To address these problems, the Obama administration, in addition to steps such as issuing a new presidential directive (Executive Order 13256) and advancing uniform standards for secrecy regulations, has created the National Declassification Center, based at the National Archives, to promote the close process of interagency coordination that is necessary to help rationalize the declassification system. Time will tell, however, whether the NDC is enough of a fix and whether it can raise review standards, reduce the impact of equity in slowing declassification, and close the vicious circle of repetitive reviews to the point where what happened with NSAM-29 does not happen again. Document 1: Chronological Summary of Significant Events Concerning the Laotian Crisis, Second Installment, 1 February to 31 March, 1961. This Joint Chiefs of Staff (JCS) chronology reports the evolution of American strategy and policy for Laos on a daily, almost cable-by-cable basis. It supplies detailed accounts of U.S. diplomacy and military action and records a growing sense of frustration in Washington at the failure of the Laotian forces of America’s ally, General Phoumi Nosavan, to make progress despite U.S. efforts to expand his capabilities. The Interagency task force where the discussions of Document 2 occurred was created in the first days of the Kennedy administration and others of its meetings are noted. The chronology is replete with delineations of schemes to use military means to make up for Phoumi’s failures, including the action list in NSAM-29 (Document 5). In the face of all the various schemes, the chronology notes President Kennedy’s March 21 decision (p. 55) to seek a multilateral diplomatic conference to solve the Laotian crisis. This became the Geneva Conference that led to agreements on the neutralization of Laos in 1962. On March 7 the interagency group followed up on a meeting with President Kennedy four days earlier by discussing military plans and a series of diplomatic moves designed to afford the United States a free hand for its other measures. The military plans are not revealed in detail, but the JCS chronology summarizes them (p. 41) as a multi-phase operation to capture the Plain of Jars with preliminary interdiction by aircraft and CIA-backed Hmong irregulars, followed with a two-pronged attack by Phoumi troops, culminating in the airdrop of Phoumist paratroops right on the Plain. The group discussed on March 7 what more could be done to train and support the Phoumi forces if the military stalemate continued, and complained of British diplomatic initiatives aimed at convening a high-level diplomatic conference to deal with the Laotian problem. This document is a different redaction of the same March 7 meeting record. It reveals that the interagency group also noted that permission had been granted for the deployment of Thai Special Forces troops from the Police Aerial Recovery Unit (PARU) to work with the CIA Hmong units under specified conditions. The State Department options paper prepared in conjunction with the military plans discussed by the interagency group on March 7 took a hard line. Observing that U.S. intentions must have been misinterpreted abroad because of Washington’s inability to induce the Southeast Asia Treaty Organization (SEATO) to agree on forceful measures, the inability of the Phoumi forces to progress on the ground in Laos, and other factors; the paper warned of an erosion of the U.S. position, and advocated measures to signal American determination. These would include a public presidential statement of concern, review of Laotian pacification planning and military training, movement of some U.S. troops to Thailand, and possible direct action against airfields in the Plain of Jars where Soviet/North Vietnamese aircraft were landing supplies for Laotian communist and neutralist forces. Anticipating a Soviet response against Phoumi-allied airbases and/or fields the U.S. was using in Thailand, the paper notes that “we should . . . be prepared to retaliate immediately by a strike against airfields in North Viet-Nam.” A marginal note on this copy by deputy national security adviser Walt W. Rostow lists concrete measures to be taken including the provision of a few B-26 bomber aircraft. President Kennedy’s decision at a White House meeting on March 9 was to initiate a series of moves to augment the strength of Laotian ally Phoumi’s forces as well as to reduce adversary capabilities. The list of seventeen elements was embodied in NSAM-29. They include increases in the size of the U.S. military aid mission, called the Program Evaluation Office (PEO), diplomatic demarches with the Soviet Union, but most particularly actions to be taken by the CIA—increases in the size of its Hmong army, B-26 bombers to by flown by U.S. and Chinese Nationalist crews in a CIA covert operation, and the provision of crews and large transport aircraft and helicopters to be flown by CIA (Air America) crews. That these measures were to be considered initial moves in a longer term operation is made clear by instructions that the CIA was authorized to commit additional helicopters and transports as they were obtained. This document is a different redaction of NSAM-29 above. This document is a third redaction of NSAM-29 above. The importance of the decision is indicated by the fact that President Kennedy personally signed this paper (as compared with NSAM-28, below). Source: United States Congress, House Armed Services Committee, United States-Vietnam Relations 1945-1967 (Government Printing Office, 1972), v. 11, p. 18. This document is a different NSAM, also approved by President Kennedy the same day, for special forces operations into North Vietnam and other “Viet-Minh territory.” The fact that the directive is signed by national security adviser McGeorge Bundy, rather than the president, is an additional indicator of the importance that should be attributed to NSAM-29 (Document 5). The continuing press of events in Laos is demonstrated by this cable, which reports that “time is now working for [the Pathet Lao]” opponents of General Phoumi. It goes on to report that the Laotian ally can still cope with the situation provided that he is furnished with the elements approved in NSAM-29: direct air support, airlift by both helicopters and transports, and more artillery support. This JCS paper shows the NSAM-29 elements incorporated into a range of options for use in Laos. Among other things the Joint Chiefs note that covert air strike missions will begin in the very near term (March 28), that U.S. forces should be readied for possible further involvement, including strikes by tactical aircraft; and that military leaders are already thinking in terms of executing a Southeast Asia Treaty Organization contingency plan for intervention in Laos. 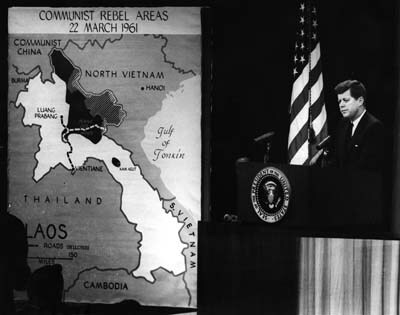 President Kennedy held the line against moving in this direction, and instead agreed to negotiate Laotian issues in the multilateral Geneva forum. 1. United States Congress, House Armed Services Committee, United States-Vietnam Relations, 1945-1967, 12v. Washington: Government Printing Office, 1972. 2. Department of State, Foreign Relations of the United States, 1961-1963, v. XXIV, Laos Crisis. Washington: Government Printing Office, 1994. 4. Victor B. Anthony and Richard R. Sexton, The United States Air Force in Southeast Asia: The War in Northern Laos, 1954-1973. Washington: Office of Air Force History, 1993. 5. Thomas L. Ahern, Undercover Armies: CIA and Surrogate Warfare in Laos, 1961-1973. Washington: Center for the Study of Intelligence, 2006.